To add equity data to the national dialogue about inclusive economies, the National Equity Atlas team regularly shares charts produced with data from the Atlas related to current events and issues. Join the conversation on social media using #equitydata. On June 6, the National Equity Atlas team (and Heartland 2050) released an updated equitable growth profile of the Omaha-Council Bluffs region at “Everyone Prospers: The Path to Equity,” a gathering hosted by the United Way of the Midlands and the Metropolitan Area Planning Agency. In reviewing the data, one of the indicators that stood out as a major challenge to economic opportunity in the region was car ownership. Reliable and affordable transportation is critical for meeting daily needs and accessing educational and employment opportunities. For households living in regions without robust transit systems, access to a car is critical, but lower-income people, people of color, and some immigrant communities are more likely to be carless. In the Omaha-Council Bluffs region, spanning 8 counties in Nebraska and Iowa, most households—94 percent—have at least one car (or truck or van). This is similar to other Midwestern metros like Kansas City and Des Moines (see this ranking chart). But there are wide differences by race: Black households are 3 times as likely as the average household to be carless. Furthermore, the Black community is geographically concentrated in the neighborhood of North Omaha where there are fewer employment opportunities and limited transit options. Living outside major job centers with limited transportation options puts these households at a unique disadvantage, especially given that 93 percent of work trips in the region occur by private vehicle. This is according to the region’s Long Range Transportation Plan (which covers the 3 most populous counties in the 8-county Omaha-Council Bluffs Region). This phenomenon is not unique to Omaha-Council Bluffs. 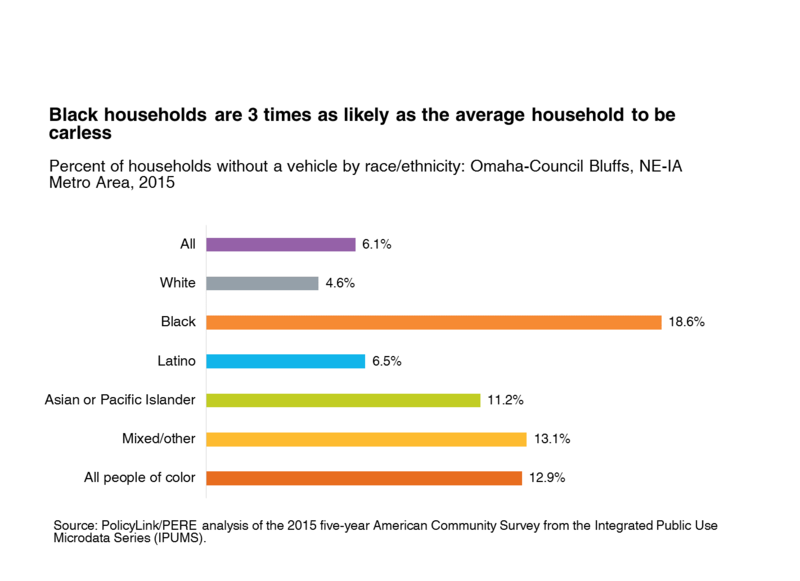 The share of Black households without a car stands at 20 percent for the nation, slightly higher than in Omaha Council-Bluffs (19 percent). Looking at the share of Black households without a car in Omaha-Council Bluffs and over a dozen neighboring regions, Omaha-Council Bluffs falls somewhere near the middle, faring better than some communities (27 percent of Black households are carless in the Minneapolis-St. Paul metro area) and worse than others (15 percent of Black households are carless in the Des Moines metro area). We also see disparities in car ownership for other communities in Omaha-Council Bluffs. Looking at immigrant and U.S.-born households, the biggest disparity is among White residents: 10 percent of White immigrant households are carless compared with only 5 percent of White U.S-born households. Bus rapid transit is one strategy to better connect residents to opportunities, and other regions such as the Cleveland metro area, have seen success. In 2008, the city launched its bus rapid transit system, successfully linking the high unemployment, predominantly Black city of East Cleveland to the region’s two largest job centers. To learn more, click here. To see how car access varies in your community, visit the National Equity Atlas and type in your city or state. Download and share the chart on social media using #equitydata.